St. George is famous for dragon-slaying. Saint George, the patron saint of England, was a Christian martyr who lived about 275 - 303 A.D. His father was from Cappadocia, and was a soldier. 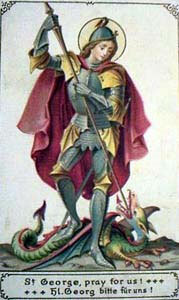 St. George followed in his father's footsteps and joined the army. He quickly rose through the ranks and became a tribune and later a count. He became a member of Roman Emperor Diocletian's personal guard. In 303, Emperor Diocletian ordered the systematic persecution of Christians across the Roman Empire. Saint George was ordered to take part in the persecution, but instead confessed to being a Christian himself and criticized the imperial decision. Enraged, Diocletian ordered the torture and beheading of Saint George. He was killed in Nicodemia on April 23, 303 A.D.
Christians soon honored St. George as a martyr. A number of churches have been built in his honor in Lydda, the home of his mother. His veneration spread throughout Palestine and the Roman Empire. Devotion to Saint George became popular in Europe in the 10th century. In the 15th century, his feast day was as popular and important as Christmas. The story of Saint George and the Dragon is a popular one in Europe. The legend takes place in a town called Silene, in Libya. The legend states that this town had a large pond where a plague-bearing dragon dwelt. To appease the dragon, the villagers would feed it sheep and maidens. The maidens of the village would draw lots to see who would be sacrificed to the dragon. One day, the lot fell upon the princess of Silene. The king, distraught with grief, told the people they could have all his gold and silver and half of his kingdom if his daughter were spared. The people, fearing the wrath of the dragon, refused. So, the princess was sent out to the lake, dressed as a bride, to be fed to the dragon. 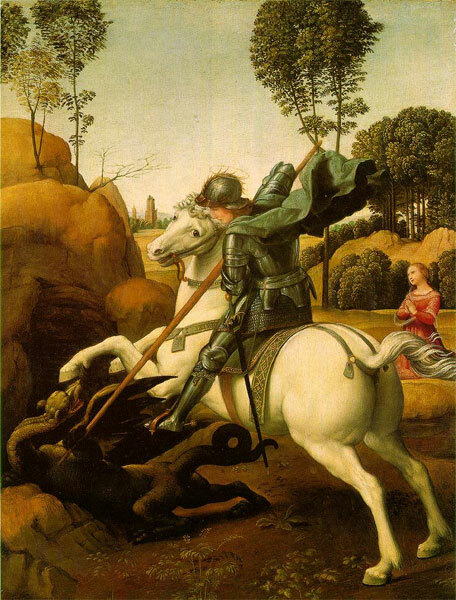 Saint George, hearing of this predicament, rode on horseback to the lake. The princess, trembling, sought to send him away, but George vowed to remain and fortified himself with the Sign of the Cross. The dragon reared out of the lake as George and the princess were talking. Saint George charged at it on horseback and pierced it with his lance. Then he called to the princess to throw him her girdle, and put it around the dragon's neck. When she did so, the dragon followed the girl like a dog on a leash. They led the dragon back into town, where it terrified the people at its approach. But St. George called out to them, saying that if they converted to Christianity and were baptized, he would slay the dragon before them. The king and the villagers agreed, 15,000 men plus women and children, and were converted and baptized. George then drew his sword and slew the dragon. On the site where the dragon died, the king built a church, which bore a spring whose waters cured all diseases.